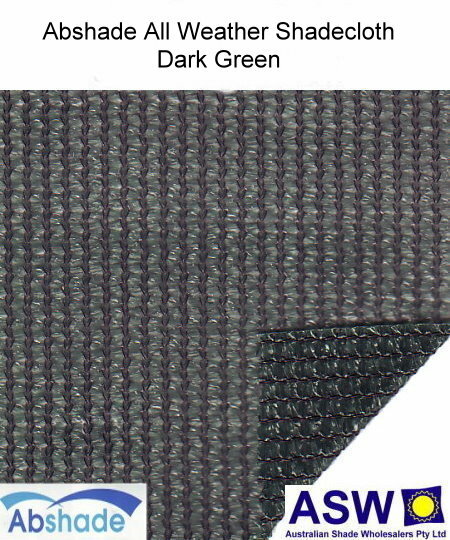 Abshade All Weather Shadecloth is composed of Domestic Plus Extra Heavy (90%) Shadecloth and is specially manufactured with a plastic coating layer on one side of the shade cloth to prevent water passing through. The Extra Heavy shade factor is ideal for home use such as pergolas, etc. Due to its’ All Weather nature, Abshade All Weather Shadecloth must NOT be used in any horizontal application as it will pond and could cause damage. It may only be used where there is adequate slope for the water to run off easily during heavy rain. There must also be adequate support on your structure frame and the fabric must be tensioned sufficiently to prevent holding water. Failure to provide the correct amount of fall and support on your pergola/structure will result in ponding of water on the fabric and damage to the pergola/structure and fabric and will void the warranty. Domestic Grade All Weather Shadecloth is primarily designed for use on Pergolas in domestic residential applications. It is not recommended for tensioned sails or other tension structures as it is not designed to tolerate heavy wind loads unless it is supported on a pergola or frame structure.